. 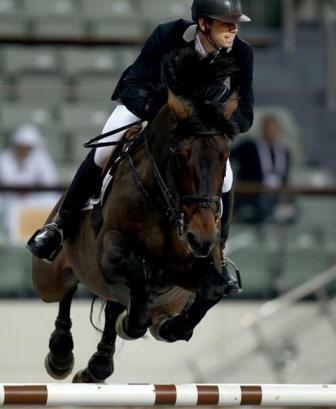 :: EGYPT'S NAEL NASSAR & LORDAN TOOK THE OVERALL STANDINGS AT THE ARTISAN FARMS YOUNG RIDER GRAND PRIX SERIES AT THE 2012 FTI CONSULTING WINTER EQUESTRIAN FESTIVAL IN WELLINGTON LAST WEEK. 1,000 CONGRATULATIONS! ::. >> EGYPT'S NAEL NASSAR & LORDAN TOOK THE OVERALL STANDINGS AT THE ARTISAN FARMS YOUNG RIDER GRAND PRIX SERIES AT THE 2012 FTI CONSULTING WINTER EQUESTRIAN FESTIVAL IN WELLINGTON LAST WEEK. 1,000 CONGRATULATIONS! By Jennifer Wood Media, Inc.
Wellington, FL - March 18, 2012 - The tenth week of the FTI Consulting Winter Equestrian Festival (FTI WEF) concluded with a day full of jumper competition at The Stadium on the beautiful grass field. Nick Skelton (GBR) and Beverly Widdowson's Big Star earned yet another victory at the FTI WEF in the $80,000 Pennfield Feeds CSI 3* Grand Prix. Skelton and Big Star beat out Cian O'Connor (IRL) and KEC Alligator Alley and David McPherson (GBR) and Chamberlain Z in a three horse jump-off. The Artisan Farms Young Rider Grand Prix Series presented by the Dutta Corporation in association with Guido Klatte concluded, and Egypt's Nayel Nassar took the top spot in the overall standings, followed by Charlotte Jacobs (USA), Lydia Ulrich (USA) and Liza Finsness (USA), who was the only clear round in today's class. Sponsored by Artisan Farms, week ten ran from March 14-18. Week 11, which features the USEF Selection Trials for the U.S. Show Jumping Team for the 2012 Olympic Games, runs March 21-25. There were 35 entries in the final round of the Artisan Farms Young Rider Grand Prix Series. Only one rider was able to find a clear path around the Vaillancourt's track, and it was Liza Finsness and Ormsby Hill, a 15-year-old Warmblood gelding, who went 28th in the order. The fastest four-faulter for second place was Charlotte Jacobs of East Aurora, NY, on Promised Land. Jordan MacPherson and Piccobello du val de Geer (the winners of round one) were third, while Catherine Pasmore and Z Canta finished fourth. Nayel Nassar and Lordan (the winners of round two) rounded out the top five. Nassar commented on the course, "It was tough. It was technical, with the big water, the triple (combination) coming at the end of the course, and a few really technical lines where you had to make sure you had control of your horse and they're focused. At the same time, they're coming into this ring for the first time, at least most of us, so you have to make sure everything is in line. It was definitely a challenge." Nassar's top five finish in today's class gave him the clear win by seven points in the overall standings for the series. There were four events in the series, and Nassar was consistent throughout on his mount Lordan, an eight-year-old Hanoverian gelding by Lordanos x Landor. For his win today, Nassar was presented with a Bruno DelGrange saddle. In the overall standings, Charlotte Jacobs and Lydia Ulrich (USA) on Santos Utopia tied with 49 points, but Jacobs' higher finish in the final round gave her the edge to be the top Under 21 rider, who will get a spot on the USEF European Young Rider Tour this summer, with transportation provided by the Dutta Corporation in association with Guido Klatte. Fourth place overall went to Liza Finsness, and MacPherson was fifth overall. Sixth place overall went to Alise Oken, who rode Kaid Du Ry. Today's challenging course was something that Finsness looked forward to, thanks to her strong relationship with Ormsby Hill. "I'm so used to Ormsby and I've been riding him for so long and know everything about him. Going into this course, I was pretty positive," she said. "This is the kind of course that we excel at, big and hard, because we're not fast. If there was a jump-off, we probably would not have won. This type of course, I knew this was our course. Alan (Korotkin), my trainer, said the same thing. We were going into this very positive." Finsness felt that the extra pressure in a series like this helps. "It means a lot (to have this series). It adds a little bit of pressure, which is always nice. When there's a lot of people and you know it's important, I feel like Ormsby jumps so much better. He knows that it's an important class. He's like, 'Liza, I got your back. We can do this.' It's pretty cool." Jacobs, who also finished second in this series last year, enjoys the competition. "I think having a format like this where you just have to keep jumping consecutive clear rounds is a good thing," she agreed. "I was more confident going into the Series this year. After last year, I really wanted to win this year; I wanted to do well again. I jumped double clear the first day and was third, and then the second one I had three down so I didn't want that to happen. I came back in the team and had one down and then jumped clear. Then I just tried my hardest to jump clear today and just had the one down, but he was great and there was only one clear, so I felt good about it." Jacobs said of her horse, "Peanut felt great. He was really, really wild, which is when he's at his best. He was bucking in the schooling area and being all crazy, and I love it when he's like that because you just gallop and everything shows up right." For Nassar, the young rider series was a big help for his young horse. "It feels great, especially to do it on such a young horse. He's only eight, but he's been really consistent throughout. We were questioning whether to bring him here to the grass ring, but it turned out for the best. I came and rode in it the first week and it went well. It's a great class. It's still tough and it's good competition. At the same time, we get to do a lot. We got to jump a team competition and we got to come out here. I think it was good experience for the riders and the horses. It was fantastic." The Artisan Farms Young Rider Grand Prix Overall presentation: ringmaster Cliff Haines, Nayel Nassar, Charlotte Jacobs, Carlene Ziegler of Artisan Farms, Tim Dutta of the Dutta Corporation, Lydia Ulrich, Liza Finsness, Jordan MacPherson, and Michael Stone of Equestrian Sport Productions. In this week's Equine Couture Large Pony Hunter Division, Kristen Lutz of Stratford, CT, earned the championship tricolor on an eight-year-old Dutch Riding Pony named Chatsworth. The pair scored two firsts, a third and a sixth over fences to top the division with 24.5 points. Lutz and her second ride, Happily Ever Laughter, owned by Madison Goetzmann, received the reserve tricolor along with Meredeth Darst and For The Laughter, owned by Dr. Betsee Parker; both mounts earned 20 points for the tie. The victorious large pony, Chatsworth, is owned by Victoria Press and currently leased by Madison Goetzmann of Skaneateles, NY. While Goeztmann is recovering from a fractured elbow, Lutz has been showing Chatsworth in the Equine Couture Large Pony Hunter division. Following today's victory, Lutz commented on the pony's performance in the show ring. "I just started catch riding Chatsworth last week for Madison," Lutz explained. "He's a really sweet pony, very smooth and consistent. Yesterday, I rode him a little more conservatively to build his confidence and he felt relaxed today. I liked the way the handy rode too, considering how some of the handy courses can be in the pony ring. This one made you think a little." According to Goetzmann, the chestnut gelding is "the sweetest pony ever, there's nothing wrong with him at all. He's just a great boy." Goeztmann began riding Chatsworth, affectionately known as Jock in the barn, shortly after indoors this past fall and has been happy with the pony's performance thus far. "I wouldn't say the transition was easy," Goetzmann explained. "I've had some really good rounds and some really bad ones, I've even fallen a couple of times. But, I've gotten to show him seven or eight times and we've won a few classes. I think he likes to show too. He goes around the ring with the cutest expression on his face!" The reserve tricolor winner, Happily Ever Laughter, is nine-year-old German Riding Pony dubbed "Boo" in the barn. Describing the difference between Boo and Jock, Goetzmann commented, "Boo definitely has a different jump. It's more square, I think. I've had a great experience with him. He's a really easy-going pony that I can just sit up on and he'll find the distances for me. Jock's style is tough to describe; I guess it's just more fancy." In the coming weeks, Goetzmann plans to give Boo and Jock some time off and head back to her hometown of Skaneateles, NY, where she attends school and plays Lacrosse, Soccer and Tennis. Additional pony championships this week went to Piece of Rain and Bit of Laughter. Piece of Rain is a seven-year-old Welsh Thoroughbred owned and ridden by Jordyn Rose Freedman of Longmeadow, MA. The bay gelding topped the Large Green Pony Hunter division with 34 points. Bit of Laughter, a seven-year-old Dutch Warmblood owned by David Gochman, emerged victorious in the Gotham Enterprizes Small Pony Hunter division, earning 42 points with Emma Kurtz in the irons. The tenth week of the 2012 FTI Consulting Winter Equestrian Festival will continue tomorrow with a full schedule of hunter and jumper competition. In the International Arena, the $32,000 WEF Challenge Cup Round 9 will be the highlight class. In the E.R. Mische Grand Hunter Ring, the Sanctuary Second Year Green Working Hunters will award championship honors.